If you think Android is limited to smartphones and tablets, think again. 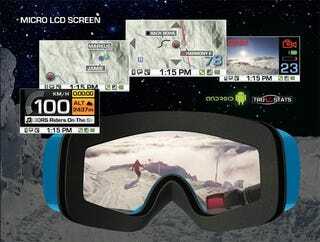 Recon Instruments have created new tech which will equip their goggles with the OS, able to run apps that deliver real-time info right in front of your face. The next generation technology will also incorporate Bluetooth capabilities allowing the goggles to connect to the user's smartphone, the first of its kind. Music playlists, caller ID and text messages will be viewable hands-free, direct-to-eye on the hill. The Bluetooth feature will also connect with wireless video cameras so the user can utilize the micro LCD display within the goggles as a viewfinder for the camera, another first.